**CALL FOR AVAILABILITY** Very clean! 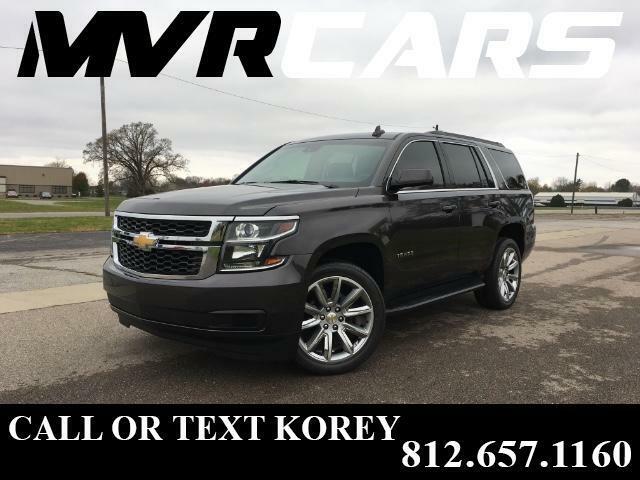 2016 Chevy Tahoe LT 4WD, 5.3L V8 Automatic, Tungsten Metallic exterior, Dark Ash interior, Non smoker, 43k Miles, 1 owner, 0 accidents, BRAND NEW Factory upgraded 22in Chevy wheels, BRAND NEW TIRES, Power sunroof, Max Trailering Package, 2nd row bucket seats, Third row seating, Power lift gate, Back up camera, Xm radio-CD-Aux-Usb-Bluetooth, Heated seats, Dual climate, Tinted windows, Weather tech floor mats in the front, Power seats, Power windows-locks-and mirrors, Running boards, Very nice Tahoe that does not need a thing! Bank financing available if needed, Please call/text Korey at 812.657.1160, Prefer text after business hours, Thank you for looking!